Highlights: Lord Rama and his wife Sita took shelter here during their 14 year exile. A chapel located inside the fort is still in use. How to Reach: Cabo De Rama fort can be easily reached by hiring a taxi or a cab from any nearby place in south Goa. There is regular bus service from Margao to Cabo De Rama fort daily. The Cabo De Rama fort located in the Canacona district of Goa is yet another famous fort in India. The fort has an interesting story as to how it derived its name. It is said that Lord Rama of the famous Hindu epic Ramayana took shelter here with his wife Sita. This was during the time when they were banished from the kingdom and were sent on a 14 year long exile in the forests of India. 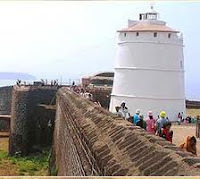 The Cabo De Rama fort of Goa is also known as Cape Rama and is a very old fort which has been located here since ancient times. The Fort was first occupied by Hindu rulers who spread their empire all over India. The fort has exchanged hands between Hindu, Muslim and Portugal rulers and has seen some of the most gruesome battles fought in history. The Portugal rulers waged battles against the Hindu rulers and established their right over the fort around 1763. It was abandoned when the Portuguese left this place. Later, this fort housed a government prison till 1955 and was abandoned again. Today, this fort is a bit ruined but is a popular tourist attraction. There is a small chapel inside the fort which is still in use. The white church and the black fort provide a photographic picture of stark contrast. People come here to pray and just enjoy the mystical atmosphere of the fort. Cabo De Rama fort gives a stunning view of the sea from the western side. You can always visit this fort if you are looking for undisturbed peace and serenity. It is a great place to spend some time with oneself and tranquility.